Astronomy news and captivating info about galaxies, constellations, meteor showers, and more! A marvelously dignified bird straddling the Milky Way Galaxy band, CYGNUS the Swan is actually relatively easy to identify even with its location along the star-studded galaxy band. Cygnus is known as the Northern Cross for being a cross-shaped constellation seen mostly in the Northern Hemisphere, and it is in the company of other bright constellations. Geographically speaking, Cygnus is typically seen north of Aquila and the dim Vulpecula, northeast of the small but identifiable Delphinus, south of Cepheus and Draco, west of Hercules and Lyra, and east of Lacerta and Pegasus. Cygnus' brightest star is Deneb, shining in the swan's tail with an apparent magnitude of about 1.25. 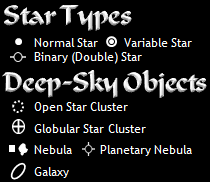 As written below, multiple deep-sky objects as nebulae, galaxies, and star clusters call Cygnus home. One interesting protoplanetary nebula is the Egg Nebula. NASA's Astronomy Picture of the Day has a new image of LDN 988, a dark nebula obscuring many stars. Nebulae: Crescent Nebula (NGC 6888 and Caldwell 27), Cygnus Loop/Netlike Nebula/Veil Nebula (NGC 6960, 6992, and 6995; NASA Astronomy Picture of the Day image here), LDN 988 dark nebula, North America Nebula (NGC 7000; NASA APOD image), Pelican Nebula (IC 5067 and 5070), and the small and young NGC 7027 planetary nebula. The background has three Hubble Space Telescope images, which are accessible at this Hubble webpage: Hubblesite.org/categories/images. — LH 95 is a star-forming region in the Large Magellanic Cloud, Dorado constellation. — Ant Nebula (also called Menzel 3) is an aptly-named planetary nebula located in the constellation Norma. — Egg Nebula (also called CL 2688) is a protoplanetary nebula in the constellation Cygnus. Thanks for visiting the Amazing Astronomy Blog, a celestial source with lots of info about constellations scattered across the night sky, nebulae cultivating newborn stars, marvelous galaxies, and more! Beloved late planetarium director and Star Gazer host Jack Horkheimer (1938-2010) is famous for the following motto: "Keep Looking Up." Thanks, Jack, for inspiring us to keep looking up to see the beauty of our galaxy! What is the Apparent Magnitude of Antares? over 22,000 pageviews, thank you! Original content © 2008–present, Wonderful World Blog Publishing. Powered by Blogger.